“standing: Jim Cannon (WPA), William Ross Knudsen (SLP), unidentified. 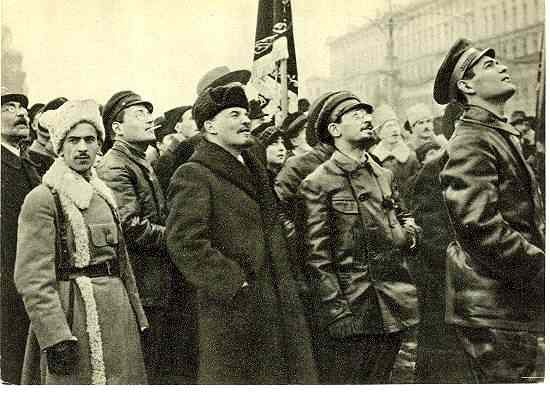 V. I. Lenin, keeping to his militant internationalism, made it a point to stay in correspondence to the international working class movement in the most direct ways possible. Preceding the days of globalization, his militant outreach to the international struggle through speeches, written works, and direct letters stood out amongst the so-called socialist organizations that lined up behind their selective nationalistic militaries marching into WWI. Like many countries, the United States labor movement was especially marred by nationalistic chauvinism, xenophobia, and institutional white supremacy that divided the working class severely. These divisions so steep within the U.S. labor movement that much of the organized left (with the exclusion of the militant IWW, Left Wing of the Socialist Party, etc.) tolerated segregation, calls for immigration restrictions, and the drive to world war amongst both their rank ‘n file as well as cadre. This conflict in the United States played out simultaneously with other countries during these world crisis within the capitalist order with the rest of the global community. Lenin, with the internationalist left, convened at the Zimmerwald Conference 100 years ago this month on September 5, 1915. The Zimmerwald Conference stood internationally as a reconstruction of the international left around one of the key principles of Marxist revolutionary theory: the necessity for a united international working class. Following the Zimmerwald Conference, Lenin had reached out internationally to reconstitute a much more valid international that stood for the core beliefs of international socialism that was originally theorized by Karl Marx and Frederich Engels. In reaching out to socialist organizations abroad, one exceptionally clear letter he wrote during this time period stood out, which was one he sent to the Socialist Propaganda League (the left-wing of the Socialist Party) in the U.S. where he called upon the League to stand unequivocally with Zimmerwald conference for international principles of the world wide proletariat. He displays two things I feel are quite pertinent to today in the United States: an established militancy around internationalism and a comradely way to carry disagreements amongst serious organizations. First, Lenin’s genuine engagement with the political composition of the left in the U.S., and especially the Socialist Party with it’s lackluster reputation internationally for its racist attitudes, is something that we rarely encounter today amongst the American left engaging in ‘balanced’ and ‘even handed’ critiques to comrades whom we should trust in struggle. Although Lenin on principle disagreed with a significant portion of the party that the Socialist Propaganda League belonged to, he makes an attempt to reach out to these genuine revolutionaries and to encourage them to struggle with him in their current position within the Socialist Party until conditions are able to change. However, this means his engagement with a socialist party awry, and not in fact politicos within the Democratic party; a capitalist party through and through committed to imperialism. This comes to my second point, and the more pertinent excerpt out of this letter, the necessity for socialists to embrace internationalism. Within the United States (as well as internationally) the phenomenon of more nationally oriented “socialists” has been well known, yet within the U.S.’s oncoming electoral cycle, which is the phenomenon around the U.S. for the first time since McCarythism has made significant gains in running for president. Bernie Sanders, inspiring leftists throughout the U.S. with his enormous rallies, unfortunately has broke an integral principle of socialism: (aside from his allegiance to the pro-capitalist Democratic party) internationalism. This position, absolutely abhorrent in the face of the worst refugee crisis since WWII of both the Middle East (especially with Syria) as well as South and Central America, comes off as fervently against the working class. The United States working class has consistently composed of economic and political refugees internationally due to its settler-colonial nature. This blatantly anti-worker stance by a “socialist” of Bernie Sanders’ stature confirms another concern that the left has had pertaining to Sanders: that he checked his ‘socialist’ card at the door of the Democratic party. Sanders is no ‘Leninist’ and the American left is far more different then when this letter had interacted with Lenin’s warning against ‘jingo-socialism’. Yet at the height of neoliberalism, and the emphasis on demonizing refugees as well as genuine anti-war positions, it is essential that socialists in the United States seriously grapple with these internal divisions being looked over by genuine revolutionary organizations in the name of ‘a movement’ that has a firm root within a capitalist party. Moving forward, the U.S. left must begin to grapple with our past to move to the future, the resurgence of major struggle within the political landscape presents an opportunity for genuine internationalism to reach the forefront of political principles of a new generation of socialists. We are extremely glad to get your leaflet. Your appeal to the members of the Socialist Party to struggle for a new International, for clear-cut revolutionary socialism as taught by Marx and Engels, and against the opportunism, especially against those who are in favor of working class participation in a war of defence, corresponds fully with the position our party (Social-Democratic Labor Party of Russia, Central Committee) has taken from the beginning of this war and has always taken during more than ten years. We send you our sincerest greetings & best wishes of success in our fight for true internationalism. In our press & in our propaganda we differ from your programme in several points & we think it is quite necessary that we expose you briefly these points in order to make immediate & serious steps for the coordination of the international strife of the incompromisingly revolutionary Socialists especially Marxists in all countries. We criticise in the most severe manner the old, Second (1889-1914) International, we declare it dead & not worth to be restored on old basis. But we never say in our press that too great emphasis has been heretofore placed upon so-called “Immediate Demands”, and that thereby the socialism can be diluted we say & we prove that all bourgeois parties, all parties except the working-class revolutionary Party, are liars & hypocrites when they speak about reforms. We try to help the working class to get the smallest possible but real improvement (economic & political) in their situation & we add always that no reform can be durable, sincere, serious if not seconded by revolutionary methods of struggle of the masses. We preach always that a socialist party not uniting this struggle for reforms with the revolutionary methods of working-class movement can become a sect, can be severed from the masses, & that that is the most pernicious menace to the success of the clear-cut revolutionary socialism. We defend always in our press the democracy in the party. But we never speak against the centralization of the party. We are for the democratic centralism. We say that the centralization of the German Labor movement is not a feeble but a strong and good feature of it. The vice of the present Social-Democratic Party of Germany consists not in the centralization but in the preponderance of the opportunists, which should be excluded from the party especially now after their treacherous conduct in the war. If in any given crisis the small group (for instance our Central Committee is a small group) can act for directing the mighty mass in a revolutionary direction, it would be very good. And in all crises the masses can not act immediately, the masses want to be helped by the small groups of the central institutions of the parties. Our Central Committee quite at the beginning of this war, in September 1914, has directed the masses not to accept the lie about “the war of defence” & to break off with the opportunists & the “would-be-socialists jingoes” (we call so the “Socialists” who are now in favor of the war of defence). We think that this centralistic measure of our Central Committee was useful & necessary. We agree with you that we must be against craft Unionism & in favor of industrial Unionism, i.e. of big, centralized Trade Unions & in favor of the most active participation of all members of party in all economic struggles & in all trade union & cooperative organizations of the working class. But we consider that such people as Mr. Legien in Germany & Mr. Gompers in the U. S. are bourgeois and that their policy is not a socialist but a nationalistic, middle class policy. Mr. Legien, Mr. Gompers & similar persons are not the representatives of working class, they represent the aristocracy & bureaucracy of the working class. We entirely sympathize with you when in political action you claim the “mass action” of the workers. The German revolutionary & internationalist Socialists claim it also. In our press we try to define with more details what must be understood by political mass action, as f. i. political strikes (very usual in Russia), street demonstrations and civil war prepared by the present imperialist war between nations. We do not preach unity in the present (prevailing in the Second International) socialist parties. On the contrary we preach secession with the opportunists. The war is the best object-lesson. In all countries the opportunists, their leaders, their most influential dailies & reviews are for the war, in other words, they have in reality united with “their” national bourgeoisie (middle class, capitalists) against the proletarian masses. You say, that in America there are also Socialists who have expressed themselves in favor of the participation in a war of defence. We are convinced, that unity with such men is an evil. Such unity is unity with the national middle class & capitalists, and a division with the international revolutionary working class. And we are for secession with nationalistic opportunists and unity with international revolutionary Marxists & working-class parties. We never object in our press to the unity of S. P. & S.L.P. in America. We always quote letters from Marx & Engels (especially to Sorge, active member of American socialist movement), where both condemn the sectarian character of the S.L.P. We fully agree with you in your criticism of the old International. We have participated in the conference of Zimmerwald (Switzerland) 5-8.IX. 1915. We have formed there a left wing, and have proposed our resolution & our draught of a manifesto. We have just published these documents in German & I send them to you (with the German translation of our small book about “Socialism & War”), hoping that in your League there are probably comrades, that know German. If you could help us to publish these things in English (it is possible only in America and later on we should send it to England), we would gladly accept your help. In our struggle for true internationalism & against “jingo-socialism” we always quote in our press the example of the opportunist leaders of the S.P. in America, who are in favor of restrictions of the immigration of Chinese and Japanese workers (especially after the Congress of Stuttgart, 1907, & against the decisions of Stuttgart). We think that one can not be internationalist & be at the same time in favor of such restrictions. And we assert that Socialists in America, especially English Socialists, belonging to the ruling, and oppressing nation, who are not against any restrictions of immigration, against the possession of colonies (Hawaii) and for the entire freedom of colonies, that such Socialists are in reality jingoes. For conclusion I repeat once more best greetings & wishes for your League. We should be very glad to have a further information from you & to unite our struggle against opportunism & for the true internationalism. N. B. There are two Soc.-Dem. parties in Russia. Our party (“Central Committee”) is against opportunism. The other party (“OrganizationCommittee”) is opportunist. We are against the unity with them. You can write to our official address (Bibliothèque russe. For the C. K. 7 rue Hugo de Senger. 7. Genève. Switzerland). But better write to my personal address: Wl. Ulianow. Seidenweg 4a, III Berne. Switzerland. This letter was written by Lenin in English.—Ed. The letter is a reply to the league’s leaflet received by Lenin in November 1915. The letter is published in full for the first time. The Socialist Party of America was formed in July 1901 at the congress in Indianapolis as a result of a merger of groups that had broken away from the Socialist Labour Party and the Social-Democratic Party in the U.S.A., among whose founders was Eugene Debs, the popular American labour leader. He was one of the founders of the new party. The social composition of the party was motley: native-born and immigrant workers, small farmers, and people with a petty-bourgeois background. The Centrist and Right-opportunist leaders of the party (V.-L. Berger, Morris Hillquit and others) denied the necessity of the dictatorship of the proletariat, refrained from revolutionary methods of struggle and confined the Party’s activities to participation in elections. 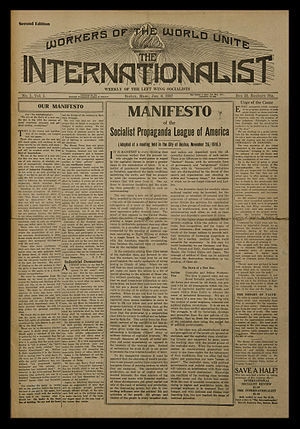 During World War I three trends formed within the Socialist Party: the social-chauvinists, who supported the government’s imperialist policy, the Centrists, who opposed the imperialist war only in word, and the revolutionary minority, who held an internationalist stand and fought against the war. Led by Charles Ruthenberg, William Foster, Bill Haywood and others and with the support of proletarian elements, the Left wing of the Socialist Party waged a struggle against the opportunist leadership of the party, for the workers’ independent political activity, and for the formation of industrial trade unions based on the principles of the class struggle. In 1919 the Left-wing split away from the S.P., initiated the formation of the American Communist Party, and became its core. At present the Socialist Party is a small sectarian organisation. The Socialist Labour Party of America was formed in 1876 at a congress in Philadelphia, as a result of a merger of the American Sections of the First International and other socialist organisations. The work of the congress was guided by F. A. Sorge, an associate of Marx and Engels. Most of the Party’s members were immigrants who had weak links with the American workers. During the first years its leadership was dominated by Lassalleans, who made mistakes of a sectarian and dogmatic nature. Some of the party’s leaders considered parliamentary activity the main party task, and underestimated the significance of party guidance of the economic struggle of the masses, while others fell into trade-unionism and anarchism. The ideological and tactical vacillations of its leader ship resulted in a number of groups splitting away from the party. Marx and Engels severely criticised the sectarian tactics of American socialists. In the nineties the leadership of the S.L.P. was taken over by its Left wing under D. De Leon who committed anarcho-syndicalist errors. The S.L.P. refused to fight for working-class partial demands, refused to work in the reformist trade unions, and continued losing its ties with the mass working-class movement, weak as they were. During World War I the Socialist Labour Party inclined towards internationalism. Under the influence of the Great October Socialist Revolution its more revolutionary section actively participated in forming the Communist Party of the U.S.A. At present the S.L.P. is a small organisation without any influence on the U.S. labour movement in the U.S.A. This entry was posted in 1915, Bernie Sanders, Internationalism, Socialist Party USA, V. I. Lenin and tagged 1915, Bernie Sanders, Internationalism, Socialist Party USA, v.i. lenin. Bookmark the permalink.